The White Oasis is located within the gated beach side area of Beachfront Mirage. This recently completed architecturally designed contemporary home offers a unique setting for those who appreciate fine design and like to indulge in a luxurious lifestyle. All furniture for the internal areas was custom made by Zuster Furniture with custom designed hand knotted rugs supplied by Rugs Carpet and Design. 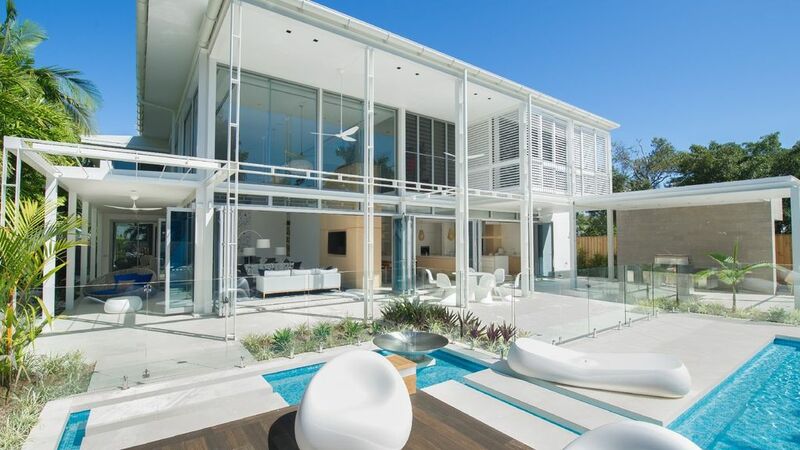 Highlight pieces and outdoor furniture were sourced from B & B Italia and Space Furniture. Artworks in each of the bedrooms and living spaces were commissioned pieces from the New York based artist Wai Ling Chan. Art glass which features throughout the house is from highly acclaimed NSW glass artist Kayo Yokoyama. The double living space with relaxed seating for 18 has six metre high ceilings and is framed by towering two storey glass windows creating a light and airy atmosphere. The living space and external pool area is also wired for surround sound. The large gourmet kitchen with a separate bar area offers all modern conveniences and is fully kitted out with Royal Doulton cutlery, china and cookware. The formal dining area which is contiguous to the kitchen to allow for relaxed entertaining, has formal seating for 16. To the left of the house is a separate state of the art media room which is also wired for surround sound. There is also a reading nook upstairs for two. Designed over two sleek and sophisticated levels, up to 10 guests can be comfortably accommodated in five spacious bedrooms each with their own en suite ensuring comfort and privacy for all. Four of the five bedrooms are located upstairs. The fifth ground floor bedroom has its own private garden and is conveniently positioned for family members with less mobility. In addition, three of the bathrooms feature a free standing bathtub. The outdoor entertaining area was designed by Rolling Stone Landscapes, seven gold medal show gardens including the Chelsea Flower Show in London and the Australian Residential Landscaper of the Year in 2006. It features a built in BBQ with a granite bench top and comprises a series of engaging ponds, pools and water features. The impressive resort style pool is heated during the winter months and stretches the width of the house with shallow areas to cater for young children and plenty of sunny spaces to top up the tropical tan. For those who wish to relax in the shade, the wrap around verandah with overhead fans and seating areas offer a cool alternative.